This spring semester at Bishop DuBourg High School has been great. Killian is the newest addition to our team, and as a PY1, has really enjoyed the change in atmosphere after having his college rotation last semester. 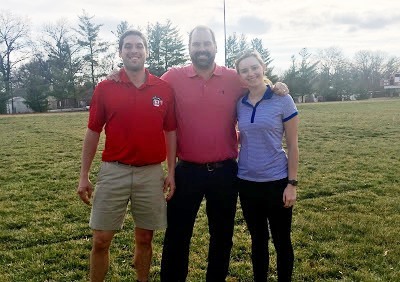 We have been caring for winter and spring sports along with our preceptor Nathan F. Jarman MAT, ATC, LAT, CSCS, CES/PES from SSM-SLU Hospital Sports Medicine. This winter we worked closely with boys and girls basketball. It was awesome to work with brand new additions to DuBourg’s coaching staff, and watch the teams develop into a family. Spring sports are now in full swing. We have been collaborating with our basketball coaches to work on enhancing performance for next years season. We are also working on overall strength and efficiency with a variety of in season athletes. At Bishop DuBourg we are the first, and many times, the last line of medical care for our athletes. We develop personal connections with them from evaluation to recovery. We counsel the students daily about good life choices, nutrition, and general physical and mental health. This means that we are more to these kids than just professionals. We are friends and role moles. We are looking forward to an exciting and healthy spring season at DuBourg, and are ready to bring home some wins! GO CAVALIERS!